Enfin! – Buffy went to France with us over the New Year. We travelled from Portsmouth to Caen on 28th December with Buffy safely tucked away in her crate in the rear of the car. She wasn’t anxious and seemed to have slept for the duration of the crossing. We walked her for a while when we left the port and then it was two more hours in the car before reaching home. She loved the garden – much more space than the one in the UK – but even more she loved the beaches. The only fly in the ointment was the steepness of the stairs in our house, she went up to explore but then discovered that her rear end was descending quicker than the front end when she tried to come down. So she waited until Peter went upstairs to carry her down. We spent an enjoyable New Year’s Eve with Marjory and Bob and their French neighbours and friends who were more than happy to celebrate the New Year with a double toasting, one at each of the French and UK midnights. The weather was really cold but dry, perfect for brisk walks. Below you can see her on a walk through the woods at Flamanville, well worth a visit even if you don’t have a dog. The entrance to the woods is on the other side of the road from the grounds surrounding the chateau. There are a couple of circuits clearly marked out – but don’t go there before noon on a Sunday during the hunting season. We were booked to come back on Wednesday 7th January but, unfortunately, the French vet had not completed all the treatments necessary when we visited him on Tuesday, so we were unable to take that sailing. We had to go to a vet near the port for the missing treatment and were re-booked on the Thursday 4pm sailing. Rather than drive two more hours each way to our house and back we stayed in a hotel, with a well behaved Buffy, in Ouistreham. When we got back to the port we were told that the 4pm sailing had been cancelled but that we could re-book on the 11pm crossing, unfortunately due to the timing of Buffy’s treatments we had to stay at the port from 4pm until the later boat sailed. Finally we reached Portsmouth at 7am on Friday 9th January, early enough for Peter to do a day’s work! Now we know exactly which three parts of her passport need to be completed by the French vet this should not happen again. Since returning Buffy has celebrated her first birthday. Now we can’t wait to take her over again in the spring as soon as Brittany Ferries restart their fast crossings to Cherbourg. Enfin! – Buffy’s second blood test showed adequate antibodies so we start the countdown. She will be able to return to the UK 6 months from the date of her second – successful – blood test. This was at the beginning of June so the first permissible date for her return would be in the first week in December. This means we will be able to bring her with us on our planned post-Christmas trip to France. Since our last post, Buffy has had her first “season”. This made for an interesting few weeks particularly when we took her out for her walks, as we had to keep a close eye on other, very interested, dogs (and her too, come to that!) Happily though, there were no mishaps. As she is such a pretty girl (well we think so) we took her along to a ring craft class to see how she would take to being shown – Crufts here we come! Although we had visions of fame and fortune we soon found out that the whole dog show business bored her rigid. She loved meeting all the other dogs and their owners but when it came to the walking up and down bit she just stood there with her head and tail hanging down. Then when the judge came up to examine her she jumped up to wash him behind his ears, which for some strange reason is frowned on. We had entered her in what would have been her first show but decided that there was no point if she wasn’t enjoying it, so no stardom for Buffy (apart from her venture into the blogosphere that is). 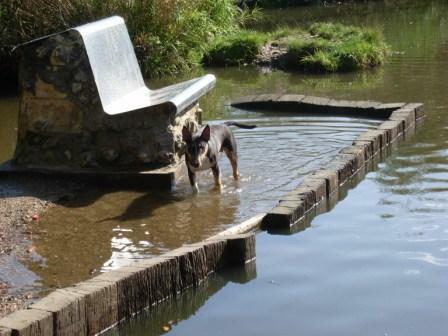 Over the last few months we have been exploring the local open spaces for the best walks. We are lucky living in Gosport as there are various areas along Stokes Bay (opposite the Isle of Wight), and the Alver Valley where she can run free and play with lots of other dogs, as well as a number of local parks. The strangely named Apple Dumpling Bridge (see above) goes over the (once mighty) River Alver linking Alver Meadow to a large area of MOD training land, where we can walk when it’s not in use, and which provides a great viewpoint over the Solent and of the Spinnaker Tower in Portsmouth. But what we’re really looking forward to of course is letting her run free on the empty beaches of Surtainville….not long now…. And just when everything was going so smoothly. We took Buffy for her blood test at the beginning of May, which involves a small sample of blood being taken and sent for analysis to determine that the inoculation has been effective, all of which passed off without incident. Two weeks later the vet rang with the results. Unfortunately the antibody level in her blood wasn’t high enough to be accepted and so the passport can’t be issued. The vet said that this wasn’t at all uncommon – about 10% of dogs fail the test first time round, and the failure rate is higher in dogs under one year old. Nothing to be done but for the rabies inoculation to be given again, and to be re-tested; the vet told us that re-inoculation invariably does the trick. So Buffy had her second inoculation, and she’ll have another blood sample taken at the beginning of June. So I suppose that the moral of the story is to allow plenty of time for the passporting process, which can’t be hurried – it takes as long as it takes. Still assuming that the next blood test turns out ok, we’ll be able to take Buffy with us when we go over to Surtainville at Christmas – we’re looking forward to letting her have a run on that long deserted sandy beach! Buffy herself is now about four and a half months old (end of May), and seems to be developing well. She now weighs about 13.5kilos – a full-grown bull terrier usually weighs in at between 24-30 kilos so she’s some growing still to do. She’s teething at the moment -dogs lose their baby teeth just as humans do – and although it must be causing her some discomfort she’s refraining from chewing the furniture (up to now at least). As preparation for her ferry trip to France we took Buffy over to the Isle of Wight with us last weekend and I have to say that she was a little angel throughout. She behaved very well on the ferry and in the car, and curled up decorously under the table when we had a pub lunch. She was also much admired by everyone whom she encountered, though I’m afraid that we expect nothing less these days! 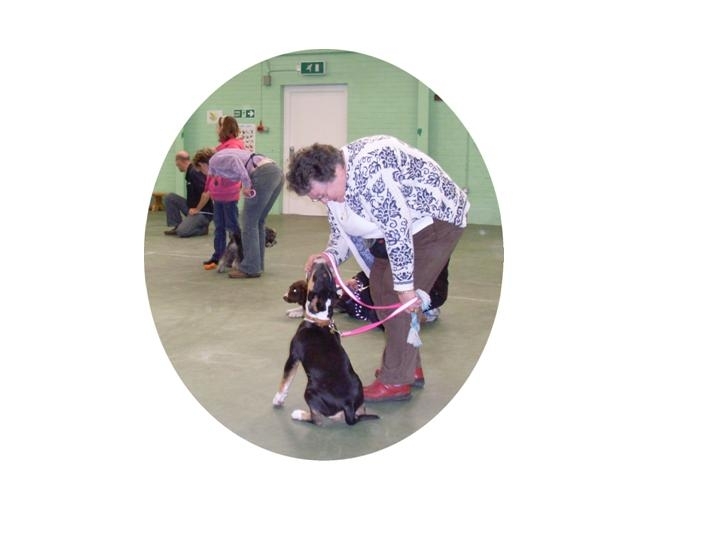 Buffy is also attending weekly dog training classes (see photo) – every Thursday a Portsmouth Community Centre echoes to the excited yelps of fifteen or so dogs of all shapes and sizes! She responds very well to positive commands (by and large when she’s told to do something she does it, especially if there’s a treat involved, and there usually is). The problem is that, being a bull terrier (a breed famed for it’s tenacity and stubbornness), she responds a lot less well to negative commands such as “Don’t do that”. Still a work in progress, I’m afraid. More when we have the results of the next blood test. Buffy is now a little over thirteen weeks old. Since she’s had the second of her set of standard injections it’s now safe for her to go out and see some of the great wide world (up until now she’s been pretty much confined to the house and garden). She took to walking on the harness and lead very well (it’s the sitting still while the harness is put on that causes difficulty). 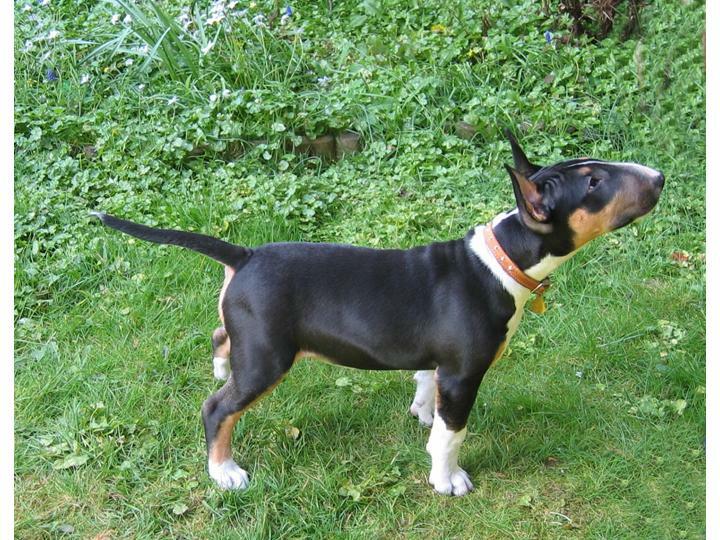 Bull terriers are very distinctive dogs, and she is very attractively marked ( OK – we’re biased), as well as being a lively puppy, all of which means that she attracts a lot of attention from other people when she is out. She is a complete tart and responds to this ecstatically. She is also very friendly towards other dogs, which comes as something of a relief. If we were going to be taking Buffy to France for good, a pet passport could now be issued, the conditions (micro-chipping and vaccinations) having been met. (The passport doesn’t become valid for travel until 21 days after the date of the rabies vaccination). However as we are not yet ready to make our permanent move, we want her to be able to travel with us, and (naturally) to be able to bring her back with us when we return to the uk. So she has to have a blood test to establish that the vaccination has taken – then there’s a six month wait. Her blood test is scheduled for the first week in May and has to be conducted by a person licensed to do so. 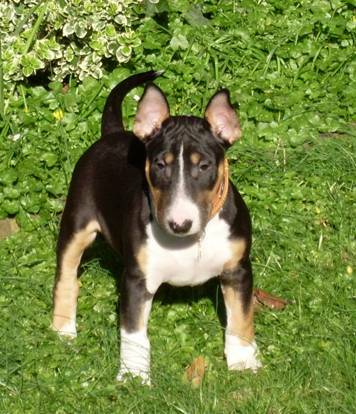 She’s a bull terrier pup and we are just beginning the EU pet passport process for her, so that we can take her over to our holiday home in Surtainville. After all, we love it over there so why shouldn’t she have the chance to enjoy the place as well? DEFRA regulations allow dogs (and cats) to be issued with a pet passport once they have been microchipped for identification purposes and vaccinated against rabies. The passport allows them to enter most EU countries – so if you’re moving to France with your pet for good, you can travel 21 days after the date of the vaccination. However to re-enter the UK the animal will require a veterinary certificate which shows that the vaccine has done what it ought to do and the rabies-neutralising antibodies are present in your pet’s bloodstream. This certificate won’t be valid until six calendar months have passed from the date on which the blood sample which gave a satisfactory test result was taken. So if you want to take your pet with you when you go on holiday then you have to plan ahead – essentially, so you can bring them back to UK with you, you’ll have to have arranged for them to be microchipped, inoculated against rabies, tested and waited the six months. The first step in the process for Buffy started when she was eleven weeks old, when we took her to the vets to have her second instalment of inoculations – the standard ones against distemper, infectious canine hepatitis, parvovirus, parainfluenza etc. The first injection had been given two weeks previously These were administered without difficulty – a quick injection in the loose skin of her back – and caused her no distress. (She did give the vet a little nip on the arm, but that was only because he didn’t move quickly enough and was a token of love, really). We also took the opportunity to have her microchipped, which was done by the veterinary nurse and who Buffy didn’t try to bite, probably because she (the dog, not the nurse) had been bribed with a dog biscuit beforehand. The needle used to inject the microchip into the back of Buffy’s neck was quite thick and the nurse warned that some dogs found it painful – bull terriers though are clearly made of sterner stuff and Buffy didn’t react at all. We also took the opportunity to weigh Buffy – two weeks previously she’d weighed 7kg but was now up to 9.4kg, a rate of growth which we found rather unnerving! Full-grown adult bullies can tip the scales at 30kg or more so she’s some way to go yet. The nurse scanned the microchip to check that it had been implanted correctly and was working as it should. Of course pet owners will often choose to have their animals microchipped even if they’re not intending to take them out of the UK as it’s an invaluable means of identification if the pet is lost or stolen. The next step in the passport process will be the rabies vaccination itself. This can’t be done before Buffy is twelve weeks old so we’ve made an appointment for two weeks hence.